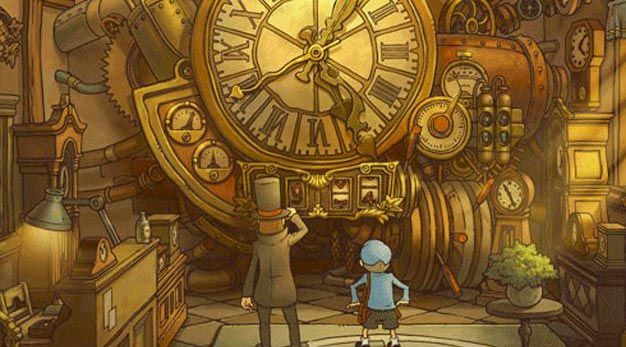 It’s holiday shopping season in Japan right now, and the number one seller is Professor Layton and The Final Time Journey, the last installment in Level-5’s trilogy of fabulous and frustrating puzzle adventures. According to Gamasutra, the new Nintendo DS game sold 347,000 units, which is 42,000 more units than Animal Crossing: Where My N—a’s At? managed moving in its debut week. That would be so like this game, which is equal parts brain teaser and hair ripper, half the time pitting you against some idiot savant’s eigth grade math homework, but that won’t stop us from playing Professor Layton and Devil’s Box and Professor Layton and The Final Time Journey when they’re finally localized for the Western hemisphere, nor from watching Professor Layton: The First Movie, an animated feature-length film currently set for a tentative February 2010 release in Japan. Riddle me this: has Stockholm Syndrome ever felt this good?